In one of the classic nuclear physics experiments at the beginning of the 20th century, an alpha particle was accelerated toward a gold nucleus, and its path was substantially deflected by the Coulomb interaction. If the energy of the doubly charged alpha nucleus was 5.00 MeV, how close to the gold nucleus (79 protons) could it come before being deflected? This is College Physics Answers with Shaun Dychko. And now for the particle that consists of two protons with no electrons around them. So, essentially it's the nucleus of a helium atom. And, it's approaching a gold nucleus, which consists of 79 protons, and as it gets closer and closer, it is going to be decelerating and getting slower and slower due to the repulsion from the gold nucleus. And, it'll reach a final position, the distance R away from the nucleus such that its kinetic energy is finally zero. And so, we're given a kinetic energy that it starts with, and its final kinetic energy will be zero. And, we need to figure out the position R such that this final kinetic energy is zero. Now, the change in kinetic energy is going to be the opposite to the change in its potential energy, and so it's going to be gaining potential energy as it gets closer and closer to this nucleus. And, that's going to be negative Q times the potential difference. 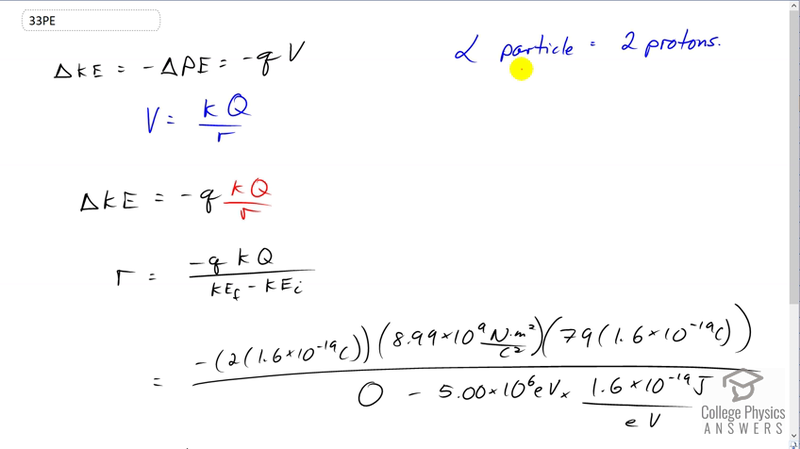 So, the potential difference with infinity being zero, is going to be K Q over R, and this capital Q is the charge in the gold nucleus, and this lowercase Q here is the charge of the alpha particle, which is two times the elementary charge, since it consists of two protons. So, we'll substitute K capital Q over R in place of V, and we have the change in kinetic energy then as negative little Q times K times capital Q divided by R. And so, we'll solve for R by mutiplying both sides by R over Delta KE. And, we get this distance where it's close as it can get to the nucleus. It's going to be negative little Q K capital Q divided by the final kinetic energy minus the initial kinetic energy. Now, the final kinetic energy is zero. And, now we plug in numbers. So, we have negative two times 1.6 times ten to the minus 19 Coulombs, this is the charge in the alpha particle, times Coulomb's constant times 79 times 1.6 times ten to the minus 19 Coulombs, which is the charge in the gold nucleus, divided by zero, final kinetic energy, minus 5.00 times ten to the six electron volts converted into Joules by multiplying by 1.6 times ten to the minus 19 Joules per electron volts. And, we end up with 4.55 times ten to the minus 14 meters is the closest these alpha particles can get to gold nuclei.